Environmental – the risk of condensation formation under metal roofs increases in colder climates (refer to the climate map on the Bradford website) where the temperature of the metal roof sheet, purlins/rafters and battens can fall below dew point (particularly metal battens). 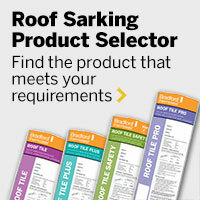 In these regions, the use of vapour permeable sarking or Anticon roofing blanket directly under the roof sheet is recommended to reduce the risk of condensation. Insulation levels – in cold climates, the use of high levels of ceiling insulation can reduce the temperature of the roof cavity which can allow the metal roof sheet temperature to drop below dew point, increasing the risk of condensation formation. The use of Anticon roofing blanket or vapour permeable sarking directly under the roof sheet is recommended to reduce this risk. Ventilation – venting moist air from kitchens or bathrooms into roof cavities increases the risk of condensation forming. Ducting of internal moisture out of the roof cavity is always recommended. Where this cannot be done, the use of vapour permeable sarking or Anticon roofing blanket plus the installation of an appropriate number of roof vents can help manage condensation. Building use – larger families produce more moisture which, unless managed correctly, can increase the risk of condensation formation in cooler climates. Appropriate use of ventilation, Anticon roofing blanket and vapour permeable sarking materials is important in colder climates. High humidity buildings (such as indoor swimming pools) require specific design solutions to reduce condensation risk and CSR Bradford should be consulted during project design. Very humid and very cold climates require specific design solutions to control condensation and CSR Bradford should be consulted during project design. Please review sarking for your climate zone and recommended metal roof sarking solutions to ensure you get the most effective sarking solution for your home.